Pair, Vintage Short-Stem Frosted Glasses. 6" Condition is Used. Shipped with USPS Priority Mail. Moon and Star Vaseline Opalescent 2 oz. Wine Glass. Made by Wright made in 1969. Th is beautiful set is n ew i n bo x wi th original st ic ke rs s ti ll o n ba se. T he a re 8 ” ta ll a nd h ol d 10 oz. A beautiful ga rn et b ut I personallyt hi nk t he y ar e pi nk w it h go ld opalescent coating. These glasses are a pinwheel design and in overall good condition. One glass has a very small scratch seen in photos. Featuring eight (8) white opalescent modern stemware glasses in two sizes. The four (4) tall wine glasses are about 7 1/4" tall. The four (4) short wine glasses are about 6 1/2" tall. I believe these are Italian. Set of 2 Brigitte by COLONY Wine Glasses Green Stem Amber to rose Bowls 81/4"
Set of 2 Beautiful Brigitte by COLONY Wine Glasses With Green tulip Stem gold to Rose Color Iridescent Bowl, stem and foot. Height 8 1/4 in. mouth 3 1/8 in. foot 3 in. center of bowl about 4in. Made in Czech Republic. Up for sale is this set of 6 rare blue opalescent wine glasses by Fenton Glass. These wines are in their Hobnail (3844) pattern and were only produced from 1951 until 1954. DO NOT DUPLICATE OR COPY! Beautiful opaline signed wine glass. Signed Sevres on base. Gold rim and leaf pattern. I was born and brought up in Ireland and moved to California in 2006 and love the Los Angeles weather and relaxed lifestyle. 4 VINTAGE INDIANA GREEN GLASS KINGS CROWN THUMBPRINT WINE CORDIAL GOBLETs. 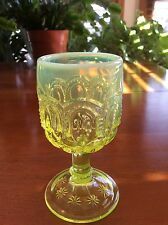 Wine cordial goblet, in great condition. 6 in tall see photos. these are very sturdy goblets. They just don't make them like they used too! It features rounded hobs covering the bowl with a smooth top band. The stem has a large hob covered knob. The foot has a scalloped step connecting the stem. The pattern is frequently confused with Duncan's and Fenton's Hobnail patterns. French Opalescent. Goblets Glasses. Juice Milk Water Wine. The goblet features an embossed design of fruit and berries. Vaseline glass glows under a black light because of the presence of uranium oxide. You can see that effect in one photo. It will hold 9 ounces. RECEIVE A COMBINED INVOICE. Not altered or broken, not worn no odors. 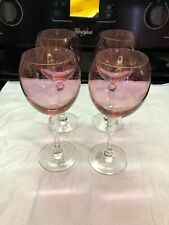 3 VINTAGE FENTON GLASS HOBNAIL FRENCH WATER/WINE GOBLET CLEAR Rare Original. Condition is Used. Shipped with USPS Priority Mail. This cordial is in opalescent white. It has the buzz saw and star pattern on the sides and the buzz saw on the bottom. The piece was made with a 4-part mold and has an 8-paneled stem. tall x 2 ¼ in. This pair of opalescent, aqua wine glasses was made around the turn of the last century. They are not signed. Both are in excellent condition. One glass has 2 straw marks inside that look like cracks. Mfg by Towne in Japan. ondition: one w/ original Towne label onglass, Excellent Condition, No flaws or defects, No Original Box! These are hand made mouth blown wine glasses. Button Arches design "SOUVENIR OF FOXCROFT, MAINE" in Red script. Nearly complete Gold loss around the top rim. There is a chip in the area between the two buttons just below the "f" in Foxcroft, thus item being listed "as found". IN AMBER WITH THIN OPALESCENT BANDS. SWIRL PATTERN. PAIR OF HAND BLOWN WATER OR WINE GLASSES. Hand blown so they are slightly different -- could be Murano but not sure. You Never Know What You Might Find. Very nice H.C. Fry wine glasses. The bowls are a smokey color with an etched wheat design. The applied stems are a white opalescent color. SET OF THREE H C FRY SMOKEY WHEAT ETCHED OPALESCENT STEMS 5 3/8" WINE GLASSES. Opalescent stem and base with a grape pattern etched into the bowl. One green glass, one smokey colour. One bubble flaw near the rim on the smokey glass (from manufacture). BLUE OPALESCENT. HOBNAILWINE GLASS. 2 3/8" BASE.